We are thiiiis close to finishing up our mudroom, but before I do the big official reveal I wanted to circle back and show you the progress we made on the element that kick started the whole project....THE bench. Here she was when we got her home. This is where life gets real. So, I don't know how any of you guys go about projects but for us, we typically have a few happening at one time. During this particular time we were working on the new laundry room door at the same time we were working on the bench. So, while one of us sanded the door the other was busy working on the bench. 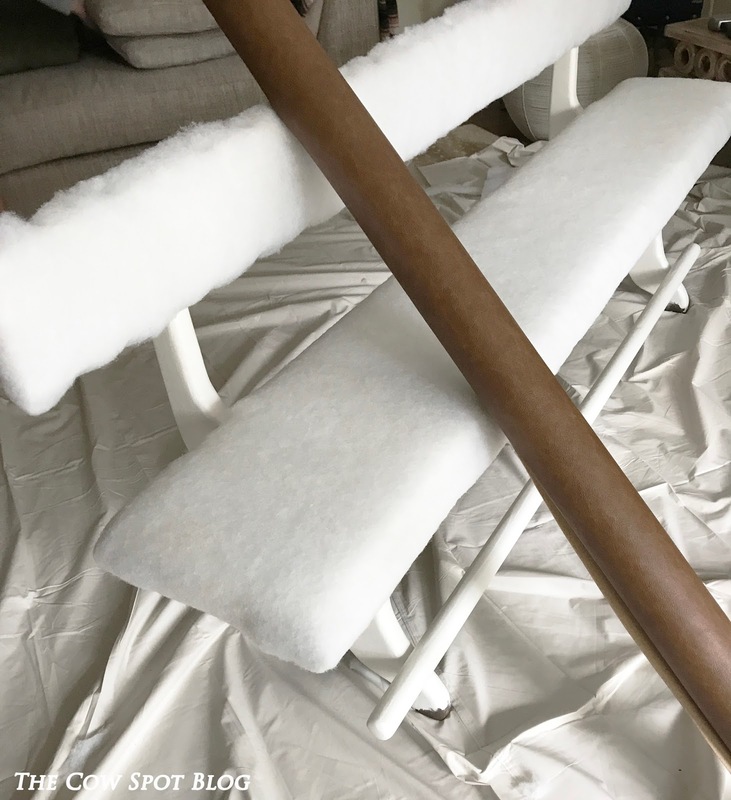 We talked through our vision for both while we worked and ultimately decided we would sand the door down and leave it raw and exposed (mostly because it's finish was beautiful underneath all of that paint) and we would stain the bench in a complimentary hue. Well, the door finished up before the bench and we LOVED the results of that project. With the door up we were ready to stain our bench. We ended up selecting Briarsmoke by Varathane. A warm, brown-gray hue. The staining process was pretty fast and we left it outside to dry all day. That night, we brought it inside and set it in place and instantly we could tell something was off. We decided to wait and see it in the light of day, but unfortunately that didn't help. The bench + the laundry door didn't work, the colors were too close to be in the same space. It looked like we tried to match and we missed. Plus, I honestly think the laundry door was so pretty and organic looking it made the bench look like it was trying too hard. It was obvious that one of them had to go and we both knew it wasn't going to be the door, so it was back to the drawing board on the bench. WOMP WOMP x 2. So, at this point we were not about to sand the bench again, but even if we were willing to, what would we do to it? Staining wasn't going to work and while we could paint it, no color felt right or obvious. 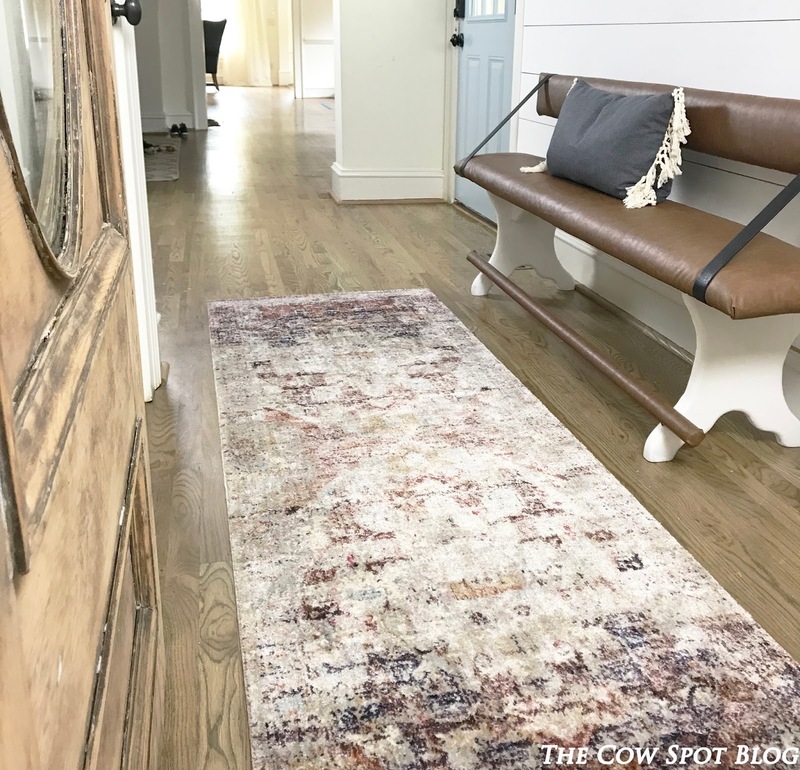 The bench needed to have personality and flair without competing with the other elements in the space (shiplap, blue door and laundry room door). As we discussed options we kept coming back to an idea we had talked about way back at the beginning, during the time we actually thought the bench was going to go in the dining room...upholstering it. I had seen an image awhile ago of a seating situation in a restaurant. It was a set-up where one side of the table had a booth and the other side had a chair. Are you visualizing? OK, so on the booth side the seat was upholstered as was a strip of cushion that had been installed up towards the area your middle back would hit if you were to sit there. 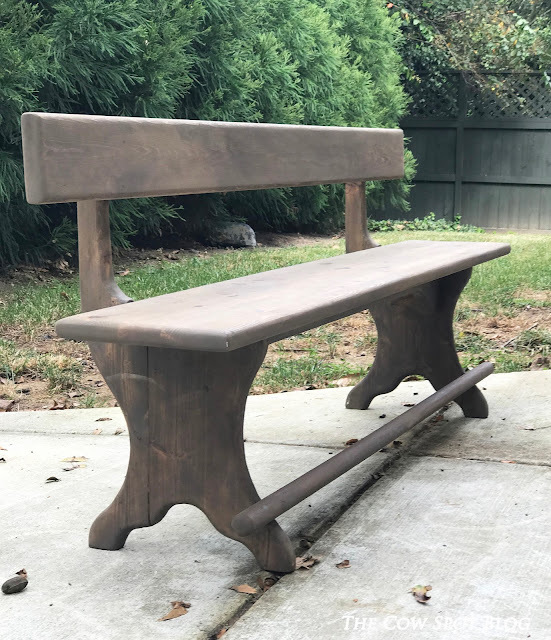 The lines of the design, while totally different kind of reminded me of our bench, specifically the thin back rail piece, and Brent and I agreed upholstering the seat and the back of the bench could produce a similar aesthetic vibe which could be cool and different. So, we loaded up the Croix and headed to the fabric store. There are a lot of fabric stores in the Atlanta area, but one place we love to go when we don't want to spend a fortune is a place called Fabric & Fringe. The place is huge and full of fabric at great prices. We didn't know exactly what we wanted, but we kind of had a thought that we wanted a leather (pleather/vinyl) look and they have a lot there. Lucky us we came upon a really pretty camel option that was $10/yd (what!!!) and decided it was the one. Fabric & Fringe also sells all of the parts and pieces you would need to upholster a piece like this so we bought some batten and a cushion there too and headed home to give DIY upholstering a whirl. Before we could do anything we painted the bench white. While the seat and the back part of the bench would be upholstered some wood would still show and we really wanted that to just kind of go away visually. So, we painted it the same color of white we plan to paint the rest of the downstairs (eventually) - Benjamin Moore's White Dove, OC-17. 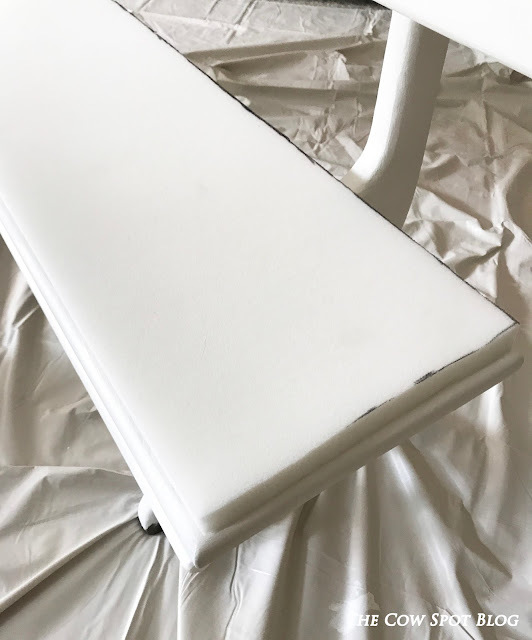 Next, we traced the bench seat with a sharpie onto the cushion so we could get a perfect fit and then used some fabric glue to attach it to the seat. Then, we wrapped the cushioned seat and the back rail in batten and secured with staples. With the prep work done we were ready for the fabric. Let me start by saying if you've been reading this blog long we all know Brent has mad skills but he really showed off on this DIY. 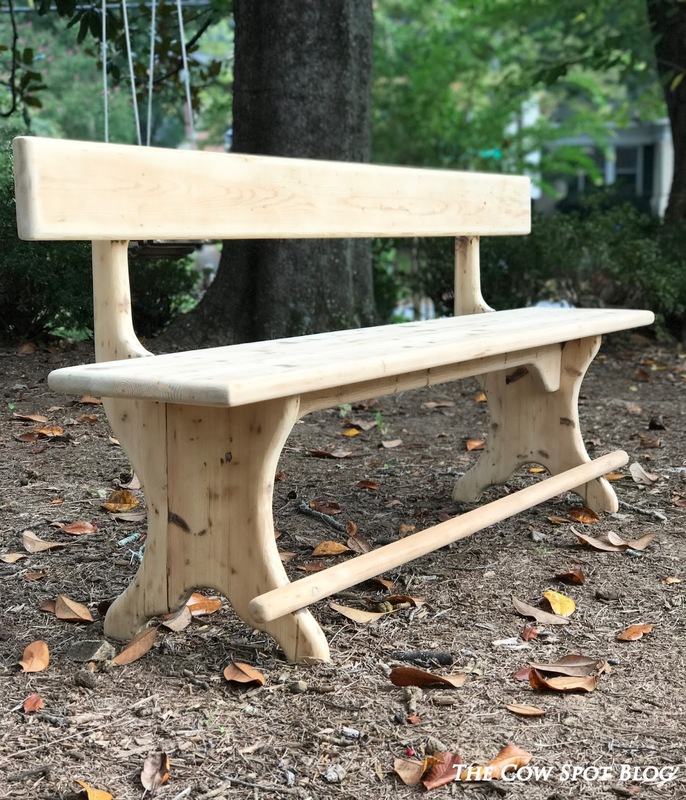 I was there, sure and every now and then I would use the staple gun to shoot a staple or two where he told me to, but for the most part he upholstered this entire bench by himself, whilst watching a UGA game. Now, he did have Croix helping, so of course that's probably the magic ingredient (ha!) but in all seriousness he had the majority of this puppy covered in vinyl in less than an hour. He would of finished the whole thing but about halfway through upholstering the top portion, the fabric ripped (womp, womp x3) so we had to get more fabric which delayed things a few days. One final detail was the addition of two leather belts. Yes, you read that right...belts. We picked two black belts up from the fabric store with plans to install them to the bench seat and the back for a little added flair. And whoa, what a difference this made! Another idea we had on the fly was to wrap the foot rail in the fabric as well and I'm so glad we did! Well, there you have it. 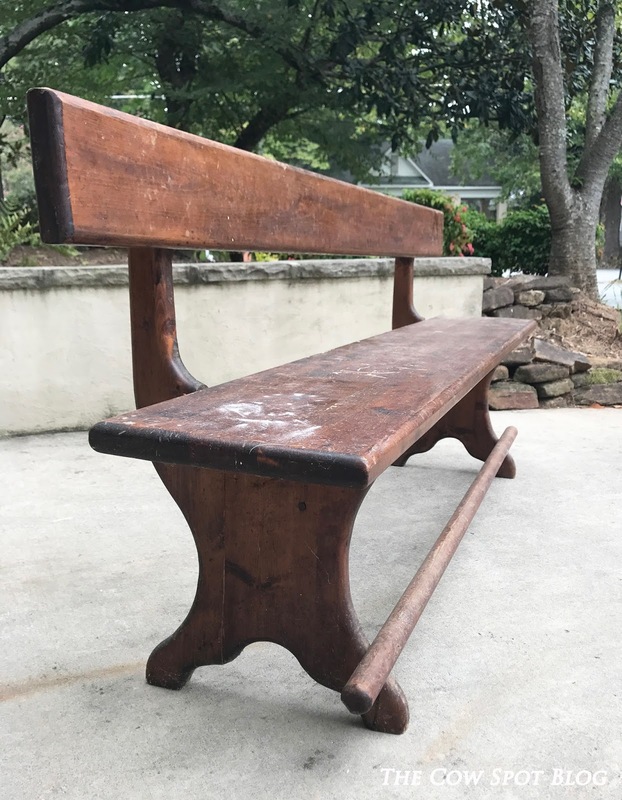 The longest post ever written about a bench. 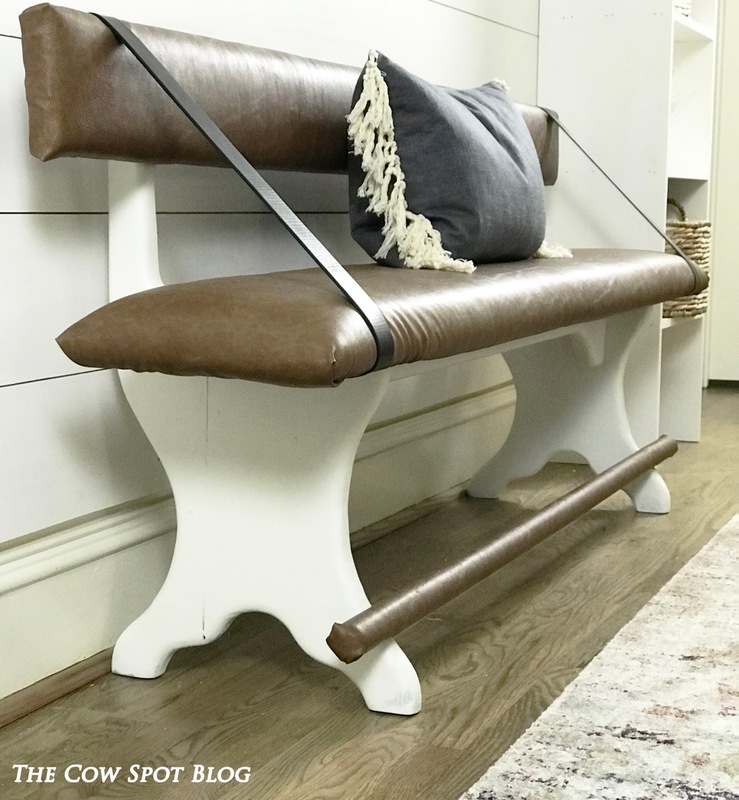 It had painful moments, no doubt, but Brent now has a back up career as an upholster and we have an awesome 100 year old bench that adds a layer of cool to our mudroom I don' think we could of gotten from something store bought.